The African Union( AU) is the Africa regional body which encompasses all 55 African governments with the main goal to accelerating the process of integration in the continent to enable Africa become an economic power house while dealing with social , economic and political problems on the continent . (g) promote industrial development through diversification and regional value chain development, agricultural development and food security; andsolve the challenges of multiple and overlapping memberships and expedite the regional and continental integration processes. This agreement would become the largest free trade area since the World Trade Organization once it is ratify . The AU need 22 members state out of the 49 that have signed the agreement to ratify it before it can come into force, and as at Jan 2019 15 out 22 countries have done so. The aim is to hit the ratifications targets by 2020. 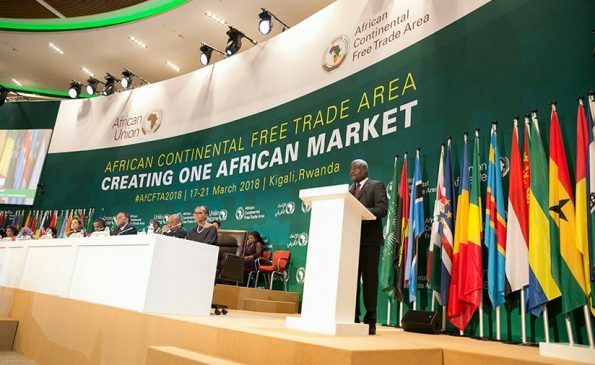 The AfCFTA hopes to double intra-African trade, which currently accounts for 16% of overall trade, by removing non-tariff and tariff barriers on a wide range of goods and services. The free trade area would ensure mutual recognition of standards, licensing and dispute mechanisms for key industries, making it easier for African companies to leverage economies of scale in new markets. I believe the biggest impact will be in ecommerce sector, the standardization of customs practices and tariffs will mean it, will be much easier and cheaper for buying online goods for transportation across African countries, the scale that ensues will ensure lower cost of transportation of goods and lowering of costs passed on to the consumer. The current investments will have access to scaling, easier and cheaper across the continent, enabling more inflow of foreign direct investment and allowing better quality startup exits. The lowering tariff barriers ensure that a large number of tech startups can begin to scale across the African continent cheaper and faster, however the opening up of markets and in the influx of new players may squeeze out smaller and less established local players. Is a Digital Single Market , Important for African Tech , Right Now!